The Pramberger piano legacy began over 225 years ago with the birth of Joseph Johann Pramberger in Tyrol, Austria in 1779. Joseph Johann began building his own pianos in Austria and the family tradition of piano making continued for six generations. The Prambergers began migrating to the U.S. in the early 1900’s and began working in New York at the Steinway & Sons factory. It was in 1958 that Joseph J. Pramberger began honing his skills at Steinway & Sons Factory. After 29 years of service as a design engineer and vice president of manufacturing, Joseph began his own piano company and designed a collection of flawless vertical and grand pianos. 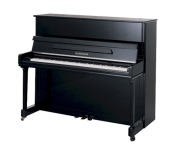 These pianos are designed to reproduce the touch and tone of the finest pianos in the world and by manufacturing these pianos in Asia, a high quality, affordable piano came into existence. Joseph J. Pramberger died in 2003, and at that time Samick Music Corp, a world leader in musical instrument manufacturing, saw the need to continue the Pramberger legacy. 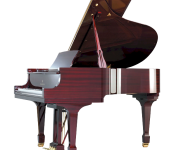 In 2004, Samick Music Corp reached out to the Pramberger family and expressed their desire to continue this legacy and purchased Josephs’ piano designs. In 2004 Samick began manufacturing these high-quality pianos, continuing the legacy of the Pramberger family for many years to come. 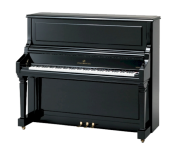 At Roger’s Piano, we carry a variety of new and preowned Pramberger pianos for sale in our showroom in Natick, MA. Contact us today at 508-545-0766 for more information or to schedule an appointment for a private showing.